Verfasst von pw am Mi, 02/24/2010 - 22:16. 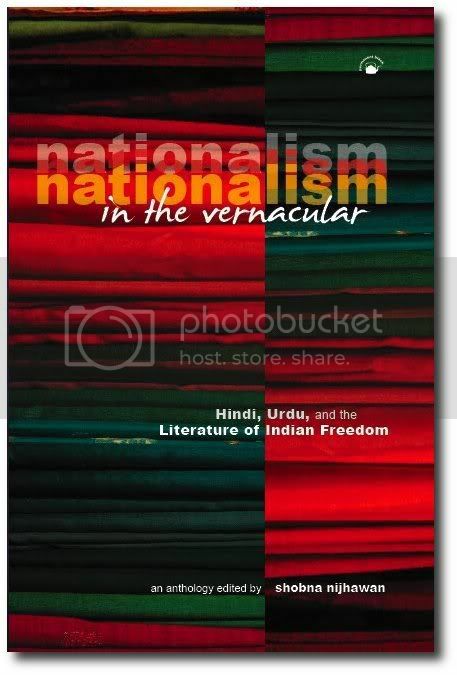 Nationalism in the Vernacular : Hindi, Urdu, and the Literature of Indian Freedom / an anthology ed. by Shobna Nijhawan. With Introductions by Vasudha Dalmia and Christopher Shackle. - Ranikhet : Permanent Black, 2010. - xvii, 517 S.
44. Sa'adat Hasan Manto (1912-1955) : The urinal / Richard Delacy. SHOBNA NIJHAWAN teaches Hindi at York University in Canada. Her PhD, on women’s Hindi journals and nationalism, was from the University of California, Berkeley. Her special areas of interest lie in South and Southeast Asian Studies (Hindi/Urdu), with an emphasis on women, gender, and sexuality. Profile page.